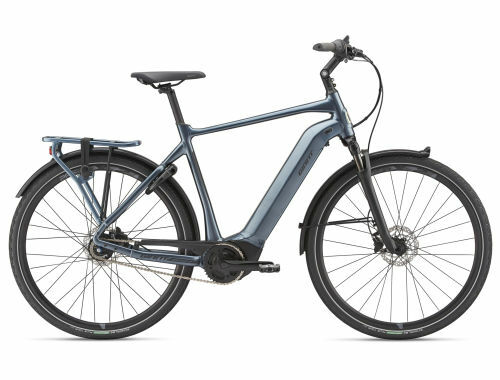 Experience all the latest E-bike technologies including automatic support, navigation, and an integrated light system. DailyTour E+ is a fun new way to ride the road. This versatile and practical E-bike is ideal for daily use in a variety of environments. It comes with all the built-in features you can think of, including a kickstand, lights, fenders and racks—all neatly designed and built to help you pack and carry your essentials. With a SyncDrive Life 60Nm motor, you also have the ability to ride in the automatic support mode. This technology determines the support you need and shifts automatically—so you can fully concentrate on the road. On-board navigation is another great feature, and it comes to you via a new RideControl EVO display that’s smoothly integrated into the handlebar. An integrated light system runs day and night, increasing your visibility and safety on the road. And a Monoshock OD2 suspension fork soaks up bumps to smooth out your ride. With a SyncDrive Life 60Nm motor, you have the ability to ride in the smart support mode, which determines the support you need and shifts automatically. On-board navigation comes to you via a new RideControl EVO display that’s smoothly integrated with the handlebar. Integrated lights run in all light conditions, day and night, to increase visibility on the road.